Editor's note: Ron Paul is an 11-term Republican U.S. representative from Texas who made a bid for the GOP presidential nomination in 2008. His book, "End the Fed," was recently published by Grand Central Publishing. Washington, D.C. (CNN) -- A growing number of Americans are becoming aware of the Federal Reserve System, what it is, how it has precipitated our financial crisis, and how it continues to pursue policies that delay economic recovery and weaken the dollar. The Fed's actions, combined with the federal government's bailout bills and stimulus packages, have struck a nerve in the American people. Recent polls have shown that more than 75 percent of Americans support efforts to audit the Fed, something which my bill, HR 1207, the Federal Reserve Transparency Act, aims to do. HR 1207 has the support of 304 members of Congress, and the Senate version of the bill, S. 604, is supported by 31 U.S. senators. Fed Chairman Ben Bernanke has embarked on an ambitious program of monetary expansion, more than doubling the monetary base to almost $1.9 trillion and doubling the size of its balance sheet to over $2 trillion, placing the American economy in a precarious position. If all this excess money begins to be loaned out, the Fed risks creating a hyperinflationary crisis similar to 1920s Germany. If the Fed contracts this money, it risks harming the banks it desperately wants to see bailed out. It is imperative that the American people know what the Fed is up to, how much money it loans to banks and what types of agreements it enters into with foreign banks and governments. Just about all of this information is exempt from audit or oversight. The Fed's actions directly affect the value of the dollar, which is coming under increasing pressure from our foreign creditors. If we do not wish to see a complete collapse of the dollar, the Fed needs to be subject to a strict audit of its actions, if not an outright abolition of its charter. While I would like nothing more than to see the Federal Reserve abolished, it is not absolutely necessary to do so with direct legislation. The Fed's influence comes about because of its monopolization of the creation of money. If we could abolish the government monopoly on the creation of money, the Federal Reserve would be forced to clean up its act or go out of business. Economists know that monopolies lead to reduced output and higher prices, a suboptimal allocation of resources. This applies as well to the market for circulating currency as it does to markets for any other good. In the previous Congress I introduced legislation that would eliminate the three major barriers to competition in currency and break the Fed's stranglehold on money. The first barrier: Legal tender laws, which Congress does not have the Constitutional authority to enact. Historically, legal tender laws have been used by governments to force their citizens to accept debased and devalued currency. Gresham's Law describes this phenomenon, which can be summed up in one phrase: Bad money drives out good money. In the absence of legal tender laws, Gresham's Law no longer holds. If people are free to reject debased currency, and instead demand sound money, sound money will gradually return to use in society. Merchants and individuals are free to choose which currencies they accept, and in the absence of legal tender laws I believe that alternative currencies will gain more traction. Stores today can accept whatever currency they like. In Washington, DC a few years ago, some stores began accepting euros from international tourists. Harrod's in London accepts pounds, euros, and dollars. There is no legal requirement in the United States for a store to accept dollars for non-debt transactions. If you walk into a 7-11 to buy a soda, the clerk doesn't have to accept your dollars, he could demand euros, silver, or copper. But because legal tender laws backing the dollar have caused the dollar to drive other currencies out of circulation, it is easier for stores to accept dollars. However, most stores also accept credit cards, personal checks, and debit cards, none of which are legal tender. Some stores are moving to credit card-only transactions to minimize costs, which they are allowed to do. The long-term strength of the dollar will only be weakened by maintaining the Fed's monopoly on our monetary system. Our foreign creditors are already moving to dethrone the dollar as the world's currency. The prospect of American citizens also turning away from the dollar toward alternate currencies should provide an impetus to the U.S. government to regain control of the dollar and halt its downward spiral. Restoring soundness to the dollar will remove the government's ability and incentive to inflate the currency, and provide stability to the financial system. With a sound currency, everyone is better off, not just those who control the monetary system. 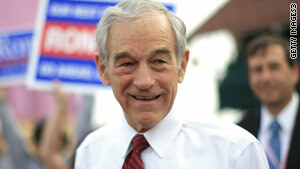 The opinions expressed in this commentary are solely those of Rep. Ron Paul.